GARDEN TYPES: Rockwool, Coir, Soil, Sphagnum, Ebb & Flow, NFT, aeroponics, aquaponics, vertical stacker, rotary, indoor, outdoor, organic, synthorganic, synthetic. Getting sweeter, bigger harvests comes when you give your plants carbohydrates that jolt them with an energy boost. This is an important fact to remember, that during peak bloom cycle your plants' need for sugars exceeds their ability to manufacture sugars. The more you push them, the more C02 and nutrients you give them, the more they need carbos, the more they fall behind. The resulting carbo deficit is the same thing that happens when athletes collapse near the end of grueling competition. And it's why carboloading is a favorite tactic athletes use to keep going strong for victory, when others fall and fail. Carboloading your plants requires a specialty formula. In actuality, your plants best absorb simple or complex carbohydrates when they are present as Arabinose, Dextrose, Glucose, Maltose and Xylose from Raw Cane Extract, Malt Extract, Cranberry Extract and other premium carbohydrate sources. Not only does this end mid-bloom slump but these materials fuel beneficial bacteria and fungi in your root zone. When you've installed beneficial bacteria and fungi in your root zone, they thrive best when they have externally-provided carbos to feed on. Beneficial bacteria and fungi increase root mass, increase nutrient absorption, protect roots, and produce hormones that stimulate floral size, potency and value. So now that you've seen how to use the right kinds of carbos to provide energy and root enhancement, what else can you do to create gourmet flowers with enhanced taste, size, potency, and aroma? As it turns out, by providing the list of carbo sources we just discussed, you're also enhancing the taste and aroma of your plants. Here's something else to keep in mind: the advantages provided by what you feed your crops depends on the quality of specific ingredients in the products. For example, you see hydroponics formulas that contain "molasses." But as with almost every individual ingredient in hydroponics formulas, there are many grades and types of molasses, and the differences between them decide whether they will deliver your bigger, better yields. Fact is, most types of molasses are loaded with sulphur or made from materials or processes that lower their sugar content and quality. When sulphured, low-grade molasses are in a hydroponics formula, its extraneous minerals throw off your nutrient ratios while providing smaller percentages of sugars. Now take a minute and let me show you how this relates to the types and forms of amino acids in hydroponics formulas. Amino acids are crucial building blocks for proteins that fuel metabolic processes and physical structure in your flowering plants. Few hydroponics formulas contain amino acids, but almost all the ones that have aminos provide them in a form called "D-Aminos." Although these aminos are cheaper to source and manufacture, they unfortunately are not very helpful to your plants. On the other hand, the L-form of amino acids is totally biologically available for rapid uptake and formation of proteins that rapidly increase your crop health and yield. As with molasses and other ingredients in hydroponics formulas, it matters a lot what forms and manufacturing processes are used. Sweeter flowers are yours when you boost your crop's taste, potency and aroma by furnishing anthocyanins, isoflavonoids, polyphenols, isoterpenes and tannins found in cranberry and grape extracts. Growers using these compounds report that a sudden bouquet of pleasant scent arises from their flowers within moments of the compounds being fed to plants in water. And after harvest, you and your friends will enjoy the extra-sweet aroma and taste that your flowers provide, and there'll be more flowers to enjoy too. Another technique for upgrading the aroma, taste and value of your crop is to feed vitamins to your plants. For example, Vitamin C stimulates photosynthesis and cell replication while also protecting your plants from negative effects of intense light and heat. To go along with Vitamin C, studies show that feeding your plants B vitamins provides many flower-boosting benefits while also protecting crops from stress. So how can you get this extensive menu of crop-boosting compounds you've just found out about? 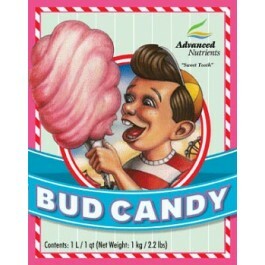 Fortunately, Advanced Nutrients scientists have successfully managed the complex task of sourcing, processing, and combining all these aminos, carbs, and vitamins so Bud Candy delivers bigger, sweeter buds to you right away. 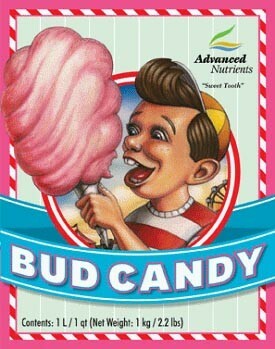 Best of all, you're getting two products in one because Bud Candy gives you everything in Sweet Leaf and CarboLoad, but it also gives you a lot more in an easy to use formula. Whether your plants are in bloom phase right now, or you're preparing for bloom phase, this is the time to procure 100% organic Bud Candy and get cotton candy taste, fatter buds, and stronger plants.